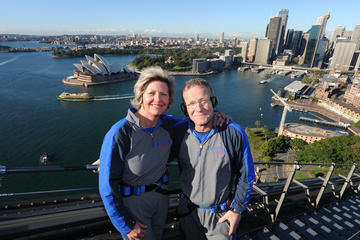 Suba a Sydney Harbour Bridge com um guia especializado para a experiência definitiva em Sydney. Consiga vistas incríveis e aprenda tudo sobre a estrutura icônica durante sua escalada até o cume de 134 metros (440 pés). Você tem várias opções para sua escalada, incluindo um passeio curto que vai até a metade. Não importa qual opção você escolher, subir este famoso local de interesse histórico lhe dará uma perspectiva espetacular sobre Sydney e uma sensação emocionante de realização. Todas as Escaladas na Ponte são limitadas a 14 participantes para garantir atenção personalizada em um grupo pequeno. Not as hard as it looks, done at a relaxed pace. Romeo was our guide and he shared his knowledge of the bridge and the city. Even for the faint of heart this is a great tour. You are completely safe. Wish I had done the full climb. I am afraid of heights, so was fearful. Felt very safe. What an experience! I was told that I must do this and I'm so glad I did. If you are worried that this is too hard, don't worry. There are a lot of steps, but they are not steep steps, so most of the time, it just feels like you are walking. There are four flights of narrow steps (walking up and then down a steep ladder). But you practice prior to the start of the climb so you are comfortable. That will be the most challenging part, but so very worth it! The guides are awesome and it's very safe. This was a must do!! I have an extreme fear of heights and our guide Fergus was so accommodating. He was knowledgeable and helped ease my fear of heights. So glad I did this. Such a surprising and awesome experience! See Sydney as you only can from the Bridge. Exquisite views, feels plenty safe with group tour and equipment and safety training. Do not hesitate to go! This tour does't have to be the length of time that it is. During vacation I like to consume alcohol and we we're breathalyzed before ascending. Luckily I was below the legal limit. Then I was not allowed to take my camera up. The monkey suit you're forced to wear has many attachments to prevent you from dropping anything into the working bridge (logical) but still they don't allow you to attach anything personal other than your sunglasses. If they attachments are on this suit, you should be allowed to take cameras up but instead they make plenty of money from selling you photos. 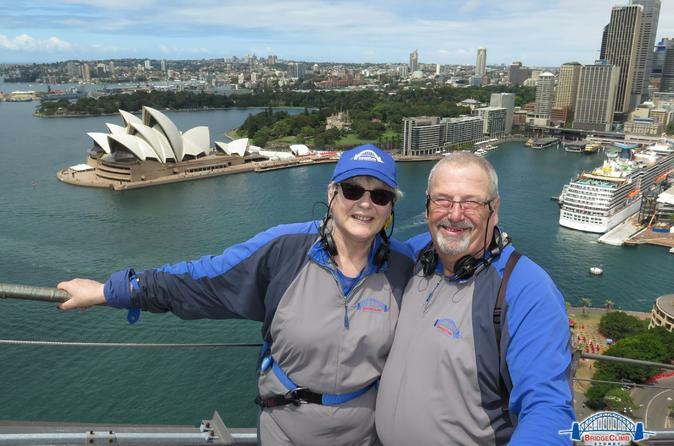 The tour guide was fine, but i'd much rather hear history of the bridge/Sydney vs. the famous folks you've met on other tours. For the amount of money we paid between the entry fee plus photos, I think it's way overpriced. one of the excellent highlights for all my overseas trips!